Implementing and managing a telehealth program may seem like a complex process, but it doesn’t have to be. Our CareDatix team can assist in getting you started and help in managing your program as well. The CareDatix Reporting & Symptom Management Programs are designed to help you create a telehealth program suitable for you and your patients. Our clinical team will help you design a program that fits your organization's care model and offers flexible management for chronic condition patients. We offer a telehealth program that assist clinical staff in managing large chronic condition populations. 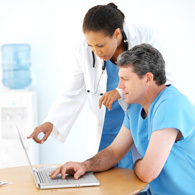 Our experienced clinical teams will review and analyze patient data transmitted on a daily basis. We can contact and triage patients whose vital signs fall out of preset ranges or are noncompliant, and report all findings to you on a daily basis. Patients in the program will receive coaching and education on their chronic illness, helping to promote patient self management and behavior modification through symptom identification and management. Call us today to find out how easy and inexpensive it can be to start a telehealth program that will lower your costs and improve patient outcomes. © 2019 All rights reserved CyberCare Health Network, LLC.